We’d love your help. Let us know what’s wrong with this preview of The Familiars by Adam Jay Epstein. Is the kingdom's fate in the hands of an orphan cat? Running fast to save his life, Aldwyn ducks into an unusual pet store. Moments later Jack, a young wizard in training, comes in to choose a magical animal to be his familiar. Jack thinks his birthday pet is magical, and Aldwyn plays along. He just has to convince the other familiars -- know-it-all blue jay Skylar and unsu Is the kingdom's fate in the hands of an orphan cat? Running fast to save his life, Aldwyn ducks into an unusual pet store. Moments later Jack, a young wizard in training, comes in to choose a magical animal to be his familiar. Jack thinks his birthday pet is magical, and Aldwyn plays along. To ask other readers questions about The Familiars, please sign up. Is this book in New Zealand? Is there a cliffhanger at the end? Not interested in this one. Both Ron and I read this fantasy tale, about three familiars; a tabby cat, a tree frog, and a blue jay, and their three young wizards in training. The story centers around the familiar's journey to save their wizards. Along the way they learn about each other, themselves and big secrets that affect the entire land of Vastia. We both appreciated the map to help us follow them on their amazing journey. Our combined average rating is 3.75, rounded up to 4 stars. "How had the fate of Vastia fallen upon a tree frog, a blue jay, and himself, a fake familiar without even the tiniest whisker of magic?" The story is seen and told through the eyes of Aldwyn, an ordinary tabby cat who suddenly finds himself pretending to be a familiar to escape a bounty hunter. The authors do a wonderful job of capturing the inner thoughts of a feline, and little touches that cat lovers will find themselves shaking their heads along in acknowledgement. The scene where Jack picks Aldwyn and there is that instant connection between them, is how we feel when all of our rescued pets have adopted us. Aldwyn must keep his secret from the other familiars, as well as the young wizards, while at the same time learning the world of magic, which becomes more difficult when they must save the young wizards. But is Aldwyn only an ordinary tabby cat? "How quickly a journey can be made in one's mind when the travels by foot took so long!" Dawn's thoughts. I liked the clever use of all kinds of magical animals used as familiars in this tale, chameleon crabs, pocket dragons to riding lizards and everything else in between. I appreciated how the three animal familiars learned of each other through discovering things about their childhoods and backgrounds, helping them to accept and learn to trust each other, showing that there is normally a reason behind someone's behavior. Though I really enjoyed these aspects and more, other things left me not so sure. Some things are not explained, not sure if this is intentional to keep readers curious, while other things are too conveniently discovered. Is my adult self getting in the way or the fact that I'm not used to reading broad fantasy like this (no, not even Harry Potter, yet), its hard to say. After reading other books in the series, I many have to come back and adjust my assessment. My rating is 3-1/2. Ron's thoughts. I liked how the three familiars worked together and learned to accept each other's differences. The unexpected twist that a secret reveals sheds a different light on everything as they and the reader know it, which opens up interesting possibilities for the future books. I feel the way it is written makes it easy for young readers to follow, especially considering all the characters and magical beings sprinkled throughout. Overall, I found it a fun enjoyable read and rate it 4 stars. We would like to mention a few scenes for adults to consider. There are two character's deaths, one where a witch gets boiled alive (157), a fight on a bridge where two people are thrown over the side (224-8) and the magical use of a wolf's snout as a tracking device which can only be obtained one way (201-2). These scenes are generally brief and not overly detailed or in anyway gratuitous, but could be a bit too graphic for some children. As Gilbert the frog says. "You know, life isn't just about looking into the past and future, it's about living in the moment and appreciating what's right in front of you." That pretty much sums up the fun of this book, just sit back and enjoy the journey before you. Maybe 2.5 stars. Here's another older review from my LJ blog; I'm adding them to GR to keep track of them. I wrote this one back in 2010. I think this book should have popularity, let me first say, at least among grade school kids, because of the spin of having a bunch of animals do the heroic questing and saving the world. And a motley group of animals they are, too -- an alley cat, a blue jay, and a tree frog. Still, it is terribly generic as a quest fantasy. It is, for lack of a better word, c Maybe 2.5 stars. Here's another older review from my LJ blog; I'm adding them to GR to keep track of them. I wrote this one back in 2010. Nevertheless, despite all my complaining, it has some fun world-building with the way the familiars interact with their magicians and an appealing lead (the scruffy alley cat Aldwyn, who relies on his smarts for most of the book instead of magic, which is at least something. Of course, it's because he doesn't think he can do magic, except when he really, really needs to, it just happens, like it always does in these books). Entertaining enough for me to finish, but not an overly great read. The characters seemed a little one dimensional - brave feline, sly/brainy jay and foolish frog (sound a little familair? It's like a furry Harry Potter). I felt sorry for Gilbert, his entire presence in the plot seemed to be to bumble around, make an idiot of himself and get mocked by all and sundry (ok, so he's more a Neville than a Ron). Plus there is no way you could disguise a frog as a chicken! Why did the jay with her awes Entertaining enough for me to finish, but not an overly great read. The characters seemed a little one dimensional - brave feline, sly/brainy jay and foolish frog (sound a little familair? It's like a furry Harry Potter). I felt sorry for Gilbert, his entire presence in the plot seemed to be to bumble around, make an idiot of himself and get mocked by all and sundry (ok, so he's more a Neville than a Ron). Plus there is no way you could disguise a frog as a chicken! Why did the jay with her awesome powers of illusion not simply make them invisible or look like something else? In fact, there were numerous situations in the tale where the simple use of her abilities could have saved them from a world of hurt. And why did the frog not ride on the cat? Tree frogs are tiny - a hopping frog could never keep up with a running cat. Ultimately, I felt the author treated the animals too much like they were people in strange bodies than if they were actually animals. And what's with the cat spending so much time awake? And not eating the bird (or for another matter, the frog). Actually, now that I think about it - for most of the book, nobody but the frog ever ate anything. And this is the second book I've read in a row about a persistent bounty hunter that just won't give up! Seriously, getting tired of the being-pursued-across-the-world-by-villain-that-can-find-you-ANYwhere... (At least in the previous one he had more justification than just money, surely even the money isn't worth risking your life for). Cute, but aimed at the 8-10 market and doesn't stand up to too much analysis by the older more cynical reader. A couple of nice, if rather predictable twists, and one quite irritating one. I'll let you figure out which is which. But I will say it will probably keep the reader's interest most of the time. There is constant activity with a simple, fully explained plot line. So kudos to the author's for that! I picked this book because I needed to read a book with a cat on the cover. This was a pleasant surprise. The familiars are very protective of their "loyals" and are quite persistent in their endeavors, which I enjoyed reading. This would probably be a good read-aloud for an 8-10 year old because it would give the parent opportunity to use various character voices, the chapters would be read more quickly, and more excitement could be added to the recitation. Storia decisamente adatta ai più piccoli,ma per chi ama i fantasy con protagonisti animali parlanti è comunque una buona avventura. I personaggi sono molto bizzarri e variegati, la magia non manca,così come il nascere delle amicizie,della fiducia e il senso della famiglia. La scrittura è molto semplice e quindi la lettura scivola via velocemente. Quello che mi ha piacevolmente stupito è il rapporto tra gli umani maghi,qui chiamati dagli animali "leali"e i loro famigli, rapporto che spero venga magg Storia decisamente adatta ai più piccoli,ma per chi ama i fantasy con protagonisti animali parlanti è comunque una buona avventura. Quello che mi ha piacevolmente stupito è il rapporto tra gli umani maghi,qui chiamati dagli animali "leali"e i loro famigli, rapporto che spero venga maggiormente messo in risalto nei prossimi libri, perché qui i ragazzini vengono intrappolati e se ne sa ben poco di loro. Sarà proprio compito dei famigli trovare la via per liberarli e questo viaggio sarà ricco anche di pericoli, ma l'unione fa la forza e tutto andrà per il meglio. Aldwyn, il gatto randagio senza si alcun potere, ma con una fortuna davvero sfacciata, saprà entrare nel cuore della rana pasticciona Gilbert e della ghiandaia so-tutto-io Skylar e, lo ammetto, anche un po' nel mio. Here is the story of Aldwyn, the brave and resourceful ally cat who accidentally becomes a familiar to the young wizard Jack. Jack and his older sister Marianne and their friend Dalton are being trained by a wise wizard and Marianne and Dalton have their own familiars, a good-natured if sometimes bumbling frog named Gilbert and a wise and somewhat uppity bird named Skylar. At first, Aldwyn relishes his time finally belonging to someone and learning about the wizarding world. But when the childre Here is the story of Aldwyn, the brave and resourceful ally cat who accidentally becomes a familiar to the young wizard Jack. Jack and his older sister Marianne and their friend Dalton are being trained by a wise wizard and Marianne and Dalton have their own familiars, a good-natured if sometimes bumbling frog named Gilbert and a wise and somewhat uppity bird named Skylar. At first, Aldwyn relishes his time finally belonging to someone and learning about the wizarding world. But when the children are captured by a good queen gone bad, it is up to the familiars to save them. And part of the plan to save them involves Aldwyn using his familiar power of telekinesis, which he lied about having in the first place. Will they still be able to save the children, or will Aldwyn find his secret outed and himself outcast? Though I enjoyed the basic premise and cast here, overall I was not captivated by the story. I probably would have stopped reading it had it not received such high reviews, including starred reviews from some professional reviewers. Perhaps the humor just didn't quite strike me in the right way, because I found most of it rather predictable and pedestrian. While Aldwyn, Gilbert and, to a lesser extent, Skylar, were certainly likable and I was rooting for the success of their mission, I never felt transported to another world. I was always conscious of reading a story. Too, a familiar pattern is repeated here (seen most famously and recently, perhaps, in the Harry Potter books) of the unlikely hero in a new (wizarding) world (Aldwyn), his kindly and humorous guy best friend (Gilbert), and the skilled and intelligent but not-always-easy-to-get-along-with girl (Skylar) and I'm not sure this book brought anything new or refreshing to the equation. Too, I was a bit confused for awhile what the book would actually be about. I would have liked a bit more build up getting to know Jack, Marianne and Dalton, too, so that I wanted them to be rescued for their own sake and not just because the familiars wanted it. I must say that I found the scene where Aldwyn and Jack first meet to be quite touching and very well written. It reminded me of meeting cats at the sanctuary where I volunteer. I felt that was pitch-perfect! The plot, while engaging enough, was a bit action-/quest- heavy for me. And some of the writing was a bit too "obvious"--stating things that we already gathered. The authors have worked in television but I think this is their first novel and it shows. However, there is also potential here and I did find myself enjoying it at times though it was not a "must read" and, despite its short length, it took me two months to finish it. Still, I think the authors really care about their characters and the world they created and this helps the reader care, too. I am not sure that I will pick up more books in the series, but as the second half of this book gained strength, I hope that the second book will be stronger than the first and provide a good read to those who are eager to carry on with the next adventure for The Familiars. This review has been hidden because it contains spoilers. To view it, click here. Hmmm I hate starting reviews. I always have trouble on what to say. I will say this "HOLY FREAKING FAMILIAR BATMAT THIS BOOK WAS AMAZING!!". I know it took me awhile to read this book, but it was not from lack of interest. It was merely because my work schedule and training kept my occupied. Seriously i cannot emphasize how good this book was. First thing first: This book is directed towards the kid/YA crowd. The writing is simple and sometimes just silly at some points. Some adults may not like Hmmm I hate starting reviews. I always have trouble on what to say. I will say this "HOLY FREAKING FAMILIAR BATMAT THIS BOOK WAS AMAZING!!". First thing first: This book is directed towards the kid/YA crowd. The writing is simple and sometimes just silly at some points. Some adults may not like its. Seeing that i'm secretly a child inside i rather enjoyed it.Don't let that keep you from reading the book though. It does contain elements such as death and attempted murder. The Familiars tackles themes such as believing in yourself, friendship. honesty, and hard work. Aldwyn started out as an ally cat and only got picked up as Jack's familiar by mistake. Soon after he is taken the grand Kalstaff's house three shooting stars fall indicating a new prophecy. Kalstaff like the queen believes that the stars indicated that Jack, Dalton, and Marianne are the new heroes. The difference being is that the queen comes and tries to kill the trio. She is prevented from doing so when Kalstaff uses the last of his life force to put a protective spell over the trio. It becomes up to the three familiars to save their masters. Their adventure is filled with challenges that leads them to discovering more about their world and themselves. Aldywn even discovers that he has magical powers. The twist for the villain is simply brilliant!! I loved it completely. I'm only going to leave a picture at the end of the post as its hint. Rating: 5 stars. Perfectly brilliant. What is a Familiar? The animal companion of a witch or wizard — a companion with which the witch or wizard can speak with, a companion that will learn with you, fight with you, and protect you. But, in this tale, the book is not from the perspective of the witch or wizard, but instead the perspective of the familiars, and one familiar in particular, a jovial alley cat named Aldwyn. I absolutely loved the early chapters of this book, especially the part where Aldwyn receives his first ever contact What is a Familiar? The animal companion of a witch or wizard — a companion with which the witch or wizard can speak with, a companion that will learn with you, fight with you, and protect you. But, in this tale, the book is not from the perspective of the witch or wizard, but instead the perspective of the familiars, and one familiar in particular, a jovial alley cat named Aldwyn. I absolutely loved the early chapters of this book, especially the part where Aldwyn receives his first ever contact with a human, and realizes the connection and special bond right away. To me, it read as if the authors truly understood that special bond between humans and pets. From there I had high hopes for this book! Unfortunately, that was the last time my hopes were so high. The book quickly reverted to less than stellar prose and less than stellar structured plot. I thought the book was going to be about Aldwyn becoming familiar with, well, being a familiar! and the construction of his bond with his Loyal (his wizard) Jack. Instead, though, the plot revolved around Aldwyn and his fellow familiars trying to save their loyals and taking down a tyrannical queen. And while I wouldn't have any issue with this plot, I think the problem here was that it felt like this plot should have been the plot of the sequel. There wasn't enough "set-up" for me to really care about the goings-on in this book. There wasn't enough with Aldwyn and Jack before Jack was taken away for me to feel the hurt of that separation. We didn't become sufficiently familiar with the world to realize how shocking it was when the queen goes suddenly evil. Instead, I felt like the authors were "telling" us what to feel instead of it coming naturally. This choppy narrative continued through out the book, where there wasn't enough set-up, and so everything felt rather contrived. The book is full of mini-adventures, but we're given back story, climax, and resolution, all in one chapter, and then moved on to the next "event." Because of this, nothing felt connected or like it was advancing the overall story or emotional connection of the characters, so I was often left with a lackluster kind of feeling. Plus, there were a few scenes that I thought were too disturbing for the otherwise very young-feel of this book. Why I read this: I thought The Familiars looked like a fun, middle grade fantasy and it's also a debut novel. Plot: A Typical fantasy plot - three human wizard apprentices are captured and the familiars must save them. Definitely full of twists, as Aldwyn has to hide his secret of having no magical abilities. Action-packed with time to build relationships, The Familiars is a great middle grade fantasy that many kids and teens will get a kick out of. Characters: I really loved Aldwyn. He's an alley Why I read this: I thought The Familiars looked like a fun, middle grade fantasy and it's also a debut novel. Characters: I really loved Aldwyn. He's an alley cat and his story is sort of the old rags-to-riches type scenario. Aldywyn is at the right place at the right time and finds himself becoming a familiar. He no longer need to con a meal daily and finds himself attached to his human counterpart. The other familiars provide a great trio of budding friends: Skyla - a bluejay who is interested in human magic, and Gregory - a tree frog who is mostly concerned with catching flies. Both have their own abilities to bring to the table. Relatability: I think that anyone can see the rag-to-riches and rescue plot lines and compare it to other age-old stories they have read growing up. Also, the humor used in the novel also helps the reader relate to the characters. Definitely was a great read and one I would highly recommend to my students. Cover Commentary: Very cute. Definitely looks magical. I especially love the title lettering. The Familiars is such a great, action packed, full of humor, quick, fun and engaging read. I think this is one book that middle graders, and fans of good old magical adventures will enjoy reading. With a loyal trio of unlikely heros, Aldwyn, Gregory and Skylar had me laughing out loud, and wishing I had pet companions like them. The familiars are animal companions with magical abilities who become life long companions with a young human apprentice. 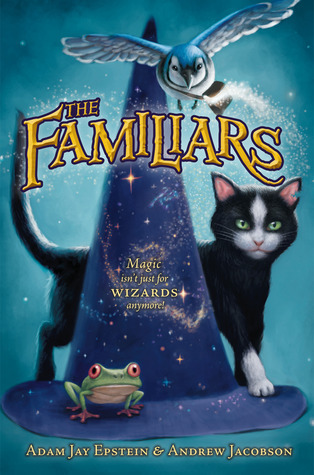 When Aldwyn, Gregory and Sklyar's Wizard appren The Familiars is such a great, action packed, full of humor, quick, fun and engaging read. I think this is one book that middle graders, and fans of good old magical adventures will enjoy reading. With a loyal trio of unlikely heros, Aldwyn, Gregory and Skylar had me laughing out loud, and wishing I had pet companions like them. The familiars are animal companions with magical abilities who become life long companions with a young human apprentice. When Aldwyn, Gregory and Sklyar's Wizard apprentices are kidnapped by the evil queen, they set off to save them. Their action packed journey is one of danger, plots twits and of personal growth, as Aldwyn has to face the lies he's been telling, that he has no magic powers. He's not the only one with secrets. This is a book I would recommend! It's fun and at times heart-stopping. I loved the main character, Aldwyn. And the best part, in my opinion, is the character Gilbert. He brings lots of light and humor to the storyline as the three friends face their first adventure together. Magia, viaggi, fughe rocambolesche e momenti di paura sono tra i pregi di questo carinissimo romanzo per ragazzi. I due autori si sono divertiti molto a creare un mondo in cui la simbiosi uomo-animale è così sentita. La storia scorre benissimo proprio perchè non ci sono mai pause e l’avventura è assicurata. I tre famigli, a cominciare dal gatto Aldwyn sono un trio che funziona alla grande, forse perchè ognuno di loro ha delle capacità innate ma allo stesso tempo delle fragilità e dei segreti che i Magia, viaggi, fughe rocambolesche e momenti di paura sono tra i pregi di questo carinissimo romanzo per ragazzi. I due autori si sono divertiti molto a creare un mondo in cui la simbiosi uomo-animale è così sentita. I tre famigli, a cominciare dal gatto Aldwyn sono un trio che funziona alla grande, forse perchè ognuno di loro ha delle capacità innate ma allo stesso tempo delle fragilità e dei segreti che incuriosiscono il lettore. Un romanzo con i personaggi più bizzarri e coinvolgenti che io abbia letto da un po' di tempo. The familiars è il primo romanzo di una serie dove i protagonisti di questo romanzo fantasy non sono i maghi o le streghe, ma piuttosto i loro famigli, animali magici che accompagnano, aiutano gli umani nelle loro missioni. Ma cosa accadrebbe se un mago sceglie un animale privo di poteri magici? Protagonista fin dall'inizio della storia è Aldwyn, un gatto randagio, senza padroni e fissa dimora, che vagabo Un romanzo con i personaggi più bizzarri e coinvolgenti che io abbia letto da un po' di tempo. Protagonista fin dall'inizio della storia è Aldwyn, un gatto randagio, senza padroni e fissa dimora, che vagabonda in una delle cittadine del vasto regno di Vastia. Costretto a rubare del cibo per poter sopravvivere fin da piccolo fa di lui un gatto prudente, non si fida di nessuno e sarà proprio durante un furto di scarti di pesce che verrà a conoscenza di un mondo a lui completamente sconosciuto... il mondo della magia. Inseguito da un famoso cacciatore di taglie si rifugia in preda al panico in un negozio dove ci sono migliaia di gabbie che ospitano tantissime specie diverse di animali... per non farsi scoprire si nasconde in una delle gabbie. Proprio in quel momento ecco sopraggiungere un giovane ragazzino dagli occhi verdi che si troverà a dover scegliere il miglior animale che possa affiancarlo nella sua avventura. E Jack sceglierà proprio Aldwyn con cui trova molte somiglianze. Tutto sembra andare bene, Jack, Kalstaff (un potente mago) e i suoi due apprendisti, Dalton e Marianne non sembrano aver notato niente di strano nel gatto e lo stesso vale per Skylar, la ghiandaia blu famiglia di Dalton e nella ranocchia Gilbert, compagno d'avventura di Marianne. Perchè rivelare di non aver poteri quando poteva finalmente avere una casa calda dove dormire e cibo a volontà? Ben presto però tutta questa tranquillità verrà disturbata da un avvenimento davvero nefasto che cambierà la storia drasticamente... una regina corrosa dalla fame di potere rapirà i tre giovani maghi e toccherà proprio ai tre famigli salvarli. Avventura dopo avventura, Aldwyn imparerà il vero significato delle parole fiducia, amicizia, famiglia. Una lezione davvero importante per lui, un povero gatto randagio che fino a poco tempo prima non aveva niente e nessuno al suo fianco. Accanto a lui nella missione ci saranno Skylar, la ghiandaia blu, un po' so-tutto-io (dai chi vi viene in mente pensando a questo termine? xD) e una ranocchia pasticciona e simpaticissima che risponde al nome di Gilbert. Le vicende dei personaggi e il loro comportamento riportano alla memoria molte similitudini riguardanti i grandi romanzi fantasy dove la magia regna sovrana: da Harry Potter ai romanzi della serie Queste oscure materie di Philipp Pullman dove il personaggio principale Lyra è affiancata dal suo daimon. Devo ammettere che nella lettura molte volte mi è venuto da dire: "Ah! Questo pezzo sembra quella vicenda avvenuta nel libro x" oppure "Certo che questo personaggio assomiglia tantissimo al personaggio y di quella serie", ma non mi ha rovinato minimamente il piacere di leggere questa storia. Un romanzo scritto per un pubblico di bambini, ma che può essere letto tranquillamente da tutti, un romanzo avventuroso, coinvolgente, divertente ed emozionante. Consigliato sia ai bambini, sia agli adulti, che come me, voglio rivivere un momento magico come è accaduto nella lettura della saga dei fantasy che ci hanno accompagnato nella nostra infanzia e nella nostra vita di lettori. Letto Divorato in un pomeriggio, una cosa che non mi capitava da secoli.. La gioia di iniziare un libro, perdersi tra le sue pagine e finirlo prima di riuscire a realizzare che magari poi domani un po’ mi mancherà, che sono una tonta a leggere un libro in modo così famelico.. Certo, ha sicuramente aiutato la brevità del romanzo (poco più di 200 pagine) e la presenza di alcune pagine con disegni.. Ma è pur vero che la storia è super carina e scorre velocissima.. Lo consiglio caldamente, sopra Wow!! Lo consiglio caldamente, soprattutto se avete voglia di staccare un po’ la spina e leggere qualcosa di leggero!! Alcuni elementi – soprattutto all’inizio – mi hanno riportato alla mente Harry Potter; e come potrebbe non essere? Ormai se si parla di maghi, di una scuola di magia, della fatidica soglia degli undici anni, di un mago potentissimo che ne ha sconfitti tanti altri in gioventù.. E’ difficile non pensare alla Rowling e al suo mondo, diciamolo! Ero già parecchio rassegnata all’idea di leggere una pallida imitazione di HP, quindi forse per questo che sono rimasta doppiamente sorpresa.. La storia prende velocemente un’altra via, si sviluppa in maniera diversa e soprattutto ha come protagonisti non i (soliti) maghi o streghe.. Ma i loro “Famigli” (sì, dal titolo e dalla trama avrei potuto anche intuirlo, direte voi.. Ma son dettagli di poco conto, questi!! :D), ovvero gli animali che vengono scelti dai maghi e che li accompagnano nel loro percorso.. Un po’ come l’Edvige o il Grattastinchi di Potteriana memoria, per capirci.. Sono loro i veri eroi della storia e il focus della narrazione (tanto che i maghi compaiono all’inizio e alla fine soltanto)! Ogni famiglio è caratterizzato da un “potere”: Skylar, una ghiandaia è in grado di creare effetti illusionistici, Gilbert, la rana, ha la capacità di predifre il futuro nelle pozzanghere.. Poi ci sono i granchi camaleonte, lucertole da cavalcate, gatti telecinetici.. E tanti altri tutti da scoprire! (nel negozio dei famigli mi sono divertita un sacco! :D). Possono parlare tra loro, con i maghi più anziani che hanno la capacità di capire gli animali e soprattutto –cosa che trovo bellissima- con i loro “leali”, i maghi cioè che li scelgono come compagni di avventura.. Insomma, un grande legame di amicizia, non c’è dubbio!! In tutto ciò aiuta molto lo stile dei due autori, semplice, immediato e spesso molto divertente.. Alcune uscite intelligenti mi hanno davvero divertito!! Certo, beninteso: è un libro pensato per un pubblico più giovane e si sente.. Però non per questo è un’opera meno meritevole! Non vedo l’ora di leggere il seguito.. Che tralaltro ho visto in libreria a 5,90 euro! YEI!!!!! Ik heb een zoon van 5 jaar oud. Doet dat er toe? Natuurlijk wel! Mijn zoon houdt van voorleesverhalen. Ik hou ervan om hem voor te lezen. Mijn zoon houdt niet van veel plaatjes en korte verhalen. Hij is al helemaal mee met het idee dat verhalen spannend mogen zijn en boeken inhoud mogen hebben. Toevallig kwam ik bij Wonderdieren. Op basis van de flaptekst en cover was mij totaal niet duidelijk dat het een eerste deel uit een reeks was. Gelukkig heb ik dus eerst dit boek gevonden en niet een ander deel Ik heb een zoon van 5 jaar oud. Doet dat er toe? Natuurlijk wel! Het verhaal zelf gaat over een doodgewone straatkat Aldwyn die achtervolgt wordt door een premiejager. Tijdens zijn vlucht komt hij door toeval in een winkel terecht waarin Wonderdieren verkocht worden. Deze dieren bezitten allen speciale talenten en worden in het boek beschreven als "huisdieren" van tovenaars en tovenaarsleerlingen. In de winkel wordt Aldwyn uitgekozen door Jack, een tovenaarsleerling. Aldwyn gaat met zijn nieuwe baasje mee naar het huis waar Jack samenwoont met de tovenaar Kalstaff en twee andere tovenaarsleerlingen Marianne en Dalton. Marianne's Wonderdier is een kikker, Gilbert en Daltons Wonderdier is een blauwe gaai, Skylar. Wanneer Kalstaffs huis aangevallen wordt en de drie tovenaarsleerlingen ontvoerd worden door koningin Loranella, kunnen enkel de drie Wonderdieren hen redden. De vraag is hoe lang Aldwyn zichzelf kan blijven voordoen als Wonderdier, terwijl hij eigenlijk niet beschikt over een bovennatuurlijke gave. Wonderdieren is een verhaal dat deels geïllustreerd is. Een leuk pluspunt, maar niet echt noodzakelijk, zeker niet omdat de tekeningen eigenlijk niet echt voor kinderen gemaakt zijn. Mijn zoon vond sommige zelfs ronduit "vreemd". Het kleine mapje voorin is ook niet echt nodig, maar stiekem vind ik het wel heerlijk om mapjes in boeken te vinden. De taal van het boek is goed toegankelijk voor kinderen. Mijn 5-jarige moest amper vragen om verduidelijking. Om zelf te lezen leg ik de leeftijd meer richting 10 jaar. Een echte richtleeftijd heb ik niet onmiddellijk teruggevonden. Wat ideaal is is de lay-out van het boek. Het lettertype is vrij groot en het interval voldoende, wat voorlezen vergemakkelijkt, en maakt dat ook oudere kinderen het gemakkelijk zelf kunnen lezen. Het boek is van 2011 en de 3 vervolgdelen zijn nergens in het Nederlands te vinden. Dit doet sterk vermoeden dat ze niet zullen volgen. Dat is wel een minpunt. Hoewel het verhaal an sich een sluitstuk heeft, voel je effectief aan dat dit eigenlijk eerder een inleiding is voor een groter avontuur. De laatste zin van het boek geeft dit ook duidelijk aan. First off let me say I really enjoyed this book. I think the authors demonstrated their passion for the genre and in my opinion created a very novel story. The story is set in the kingdom of Vastia, a mangy stray black and white cat missing a chunk of his left ear begins to feel his whisker’s tingling. On this day it means that Aldwyn is hungry and he goes in search of food to the nearest fish monger. Unknowingly, he steps into a trap. After stealing a fish, Aldwyn finds himself fleeing from Grim First off let me say I really enjoyed this book. I think the authors demonstrated their passion for the genre and in my opinion created a very novel story. The story is set in the kingdom of Vastia, a mangy stray black and white cat missing a chunk of his left ear begins to feel his whisker’s tingling. On this day it means that Aldwyn is hungry and he goes in search of food to the nearest fish monger. Unknowingly, he steps into a trap. After stealing a fish, Aldwyn finds himself fleeing from Grimslade the bounty hunter and seeks shelter in the closest place he can find. At the same time, it is young Jacks birthday and a strong and powerful wizard is about to purchase his young apprentice a very special birthday present. In his effort to escape Grimslade, Aldwyn has now become a familiar to young Jack. The focus of the story becomes one in which Aldwyn must join forces with Skylar and Gilbert on a quest to save their kidnapped loyal companions and also the kingdom from an evil Queen. However, the queen conjures obstacles for them to conquer along the way. Early on the authors hint that this is a story about “the three T’s of animal companionship: temperament, toughness and talent.” More importantly, it is about a "connection that the familiars share with their loyals." It is this bond that is the driving force of the story and makes them so endearing to me. As a reader we begin to love Aldwyn because he chooses to stay and help the other familiars out of obligation, loyalty and a love of Jack despite his having misgivings of being just an ordinary common magicless animal . We laugh with Gilbert as he calls himself “amphibiously challenged” and tries to go to his “happy place” when scared. And we speculate as to what Skylar’s anklet really means and why was Aldwyn abandoned? And we wonder at the three companions magical abilities. I especially like that these familiars have very strong virtues that are not revealed to early but allowed to develop as they go on their quest. I also really loved that Aldwyn changes as a result of his actions and because of the virtues that he innately had all along but doubted. In the end, we are left with mysteries to ponder and further stories to come but also left with rich characters and an exciting world that you really would like to learn more about. Plus, we haven’t learned enough about Marriane, Dalton and Jack yet either. Infine mescolate il tutto con un abbondante dose di magia. Et voilà, ecco a voi "The Familiars"! i protagonisti principali sono i tre animali! Per l'esattezza loro sono "famigli", ovvero animali dotati di una particolare caratteristica magica, che assistono i loro "leali", maghi con i quali hanno una particolare connessione. e infine il meraviglioso Aldwin, un gatto randagio che grazie ad una serie incredibile di eventi, si è ritrovato a diventare il famiglio del maghetto Jack. Una storia affascinante di amicizia, lealtà e tanta, tanta magia. Adatto sia ad un pubblico di adulti che di bambini, questo libricino vi trasporterà nelle terre di Vastia e lì vivrete una bellissima avventura incontrando Orrobestie, Troll, streghe, un Idra e tanto altro! La curiosità sulle vicende dei tre famigli mi ha fatto divorare le pagine una dopo l'altra e i miei occhi famelici hanno più volte sorriso alle parole scritte grazie a piccole battute o semplici giochi di parole. Bravo lo scrittore e bello il libro! Se avete nostalgia di mondi dove tutto è possibile e della magia che li circonda, questo libro fa al caso vostro! This is a perfectly woven tale that should appeal to everyone! The story centers around three animal familiars who have magical capabilities (think the triumvirate of Harry Potter) and their human loyals. Familiars have been in story telling as long as there have been witches and are creatures who bond with humans and assist them in casting spells. Aldwyn, an alley cat on the run, hides in a magical pet store where he is quickly adopted by Jack and meets other familiars. Gilbert the tree frog (p This is a perfectly woven tale that should appeal to everyone! The story centers around three animal familiars who have magical capabilities (think the triumvirate of Harry Potter) and their human loyals. Familiars have been in story telling as long as there have been witches and are creatures who bond with humans and assist them in casting spells. Aldwyn, an alley cat on the run, hides in a magical pet store where he is quickly adopted by Jack and meets other familiars. Gilbert the tree frog (paging Gilbert Gottfried) and Skylar, a smug know-it-all blue jay. The three must come together to save the humans from the evil familiar of the queen. After reading about the queen's evil hare, I was immediately reminded of Senator Kevin, the bunny of the apocalypse from the Prickly City comic strip. The story, like all good fairy tales, involves a quest and the three must find the answers to some riddles in order to find elements that will help them defeat Paksahara, the evil hare. There is comic relief woven in with edge of your seat action that will have you finishing this book in no time! I really think that this book could be read aloud to a younger child and it would be enjoyable for both reader and listener. I can really see this made into a movie much like the Secret of Nimh. This will really appeal to readers of the Tale of Desperaux and the Spiderwick Chronicles. Okay – so I’m not a fan of books where animals speak and the story generally revolves around animals (and no, I never read that Warrior series). I used to love the movies centering around animals as a kid (Hello, Homeward Bound and Beethoven), but outgrew them in my teenage years. Then The Familiars made it’s way through the blogosphere.. well, I would say.. burst its way instead of made its way. I’m seeing this book everywhere. My dislike of animal books kept me from outright buying it.. but now Okay – so I’m not a fan of books where animals speak and the story generally revolves around animals (and no, I never read that Warrior series). I used to love the movies centering around animals as a kid (Hello, Homeward Bound and Beethoven), but outgrew them in my teenage years. Then The Familiars made it’s way through the blogosphere.. well, I would say.. burst its way instead of made its way. I’m seeing this book everywhere. My dislike of animal books kept me from outright buying it.. but now that I’ve read my library’s copy I’m thinking I may just have to make the investment. This is the best middle grade book I’ve read in a while., ranking up there with the Gregor series and the Ranger’s Apprentice series (which I love, love, love). The story could have been corny – I mean, we’re talking about a cat, a tree frog and a blue jay here – but it worked. And I loved said tree frog. He made the book for me. I’m still cackling with laughter over some of his lines. The Familiars is such a great, action packed, full of humor, quick, fun and engaging read. I think this is one book that middle graders, and fans of good old magical adventures will enjoy reading. With a loyal trio of unlikely heros, Aldwyn, Gilbert and Skylar had me laughing out loud, and wishing I had pet companions like them. The familiars are animal companions with magical abilities who become life long companions with a young human apprentice. When Aldwyn, Gilbert and Sklyar's Wizard appren The Familiars is such a great, action packed, full of humor, quick, fun and engaging read. I think this is one book that middle graders, and fans of good old magical adventures will enjoy reading. With a loyal trio of unlikely heros, Aldwyn, Gilbert and Skylar had me laughing out loud, and wishing I had pet companions like them. The familiars are animal companions with magical abilities who become life long companions with a young human apprentice. When Aldwyn, Gilbert and Sklyar's Wizard apprentices are kidnapped by the evil queen, they set off to save them. Their action packed journey is one of danger, plots twits and of personal growth, as Aldwyn has to face the lies he's been telling, that he has no magic powers. He's not the only one with secrets. Can't believe they are making this one into a film. On second thought, the predictable plot and stock characters have sold tickets before, so why wouldn't they rip-off the old, repackage it, and sell it to us again? This one kind of reminded me of the Warriors series, in a passing way. Usually I don't do fantasy novels like these, with the exception of like Harry Potter, but I'm kinda glad I did pick this one up. It certainly has its good parts. For a novel meant for younger people than I, I actually enjoyed it. Read this aloud to my 6-year-old. It was full of adventures and great for her age. Not much is original in terms of characters or plot, but my daughter didn't notice. She was excited to get the next one immediately from the library. I loved The Familiars; it was engaging, action-packed, entertaining and a good middle-grade novel. The idea of familiars is original and interesting - I'm glad that animals finally have the spotlight rather than humans. Human magic is always emphazized rather than the animals so points for this books because of that. I'm sick of seeing human wizards and witches in fantasy. Anyway, Aldwyn an alley cat who steals to survive winds up in a odd pet shop where he is chosen to be a young human apprentic I loved The Familiars; it was engaging, action-packed, entertaining and a good middle-grade novel. The idea of familiars is original and interesting - I'm glad that animals finally have the spotlight rather than humans. Human magic is always emphazized rather than the animals so points for this books because of that. I'm sick of seeing human wizards and witches in fantasy. My favorite character is Pakanshara. She is blessed with my favorite ability, shapeshifting, and is trying to place the animals at the top because the humans changed their proud history. I find that intriuging and I really did wish she succeeded in her goal and I hope she does even though my hope is futile. She's quite the character. Otherwise, I enjoyed Aldwyn, Skylar and Gilbert. I loved Skylar the most 'cause Sky was as stubborn as a horse on a sunny afternoon. She flew with elegance and grace but had a whole slew of secrets in her aresnal. I'm glad that this story, though including wizards, had plenty of twists and nice touches rather than the endless slew of cliches and details in Harry Potter. I'm not a fan of HP as you can see. The back flap of the book says it all: "The Familiars combines the magic of Harry Potter and the adventure of the Warriors into an enchanting story young readers will love." --Michael Buckley, author of The Sisters Grimm and NERDS series. I really had no idea what I would think of The Familiars. I knew, however, that I was very eager to read it. So eager, in fact that I abandoned another book I was reading just to read this one. And boy, am I happy I did. One unique thing about this book was that the main characters are animals. I know talking animals may seem weird at first, but once you get to know them more as characters, you forget about their animal-ness. I knew I loved each of the familiars’ personalities and wanted each of I really had no idea what I would think of The Familiars. I knew, however, that I was very eager to read it. So eager, in fact that I abandoned another book I was reading just to read this one. And boy, am I happy I did. One unique thing about this book was that the main characters are animals. I know talking animals may seem weird at first, but once you get to know them more as characters, you forget about their animal-ness. I knew I loved each of the familiars’ personalities and wanted each of them as a familiar of my own. Except maybe Skylar. She was a bratty bird. The loyals and other humans weren’t as fleshed out as I would’ve wanted them to be, but they were great additions to the cast of characters also. Though the book is written by two authors, I really couldn’t tell. I loved how these two guys were able to write a fun, adventurous fantasy book that is able to cater to all ages. I loved the fact that this book is based in an entirely different world than any I have ever read about or lived in before. Though sometimes predictable, the story is lighthearted and fun. Filled with twists and turns you are bound to enjoy, The Familiars is a book that you will want to read again right after you are finished. I know I did! I loved the distinctive animal communities the trio visited during their adventure. And it was great to see them change throughout their journey. I grew up in Great Neck, NY loving all things fantasy and science fiction - from Dungeons and Dragons and the Legend of Zelda to Star Wars and Dr. Strange. I created and imagined new worlds and stories from an early age but never knew that I had the talent to be a writer until seventh grade, when my English teacher assigned our class to write the first ten pages of a sequel to The Good Earth. Afte I grew up in Great Neck, NY loving all things fantasy and science fiction - from Dungeons and Dragons and the Legend of Zelda to Star Wars and Dr. Strange. I created and imagined new worlds and stories from an early age but never knew that I had the talent to be a writer until seventh grade, when my English teacher assigned our class to write the first ten pages of a sequel to The Good Earth. After that, I was hooked.